The Muppets return to primetime with a contemporary, documentary-style show. For the first time ever, a series will explore the Muppets’ personal lives and relationships, both at home and at work, as well as romances, breakups, achievements, disappointments, wants and desires. This is a more adult, new Muppet series, for “kids” of all ages. Bill Prady (The Big Bang Theory) and Bob Kushell (Anger Management) are co-writers and executive producers. Randall Einhorn (Wilfred), Bill Barretta, Debbie McClellan and Kyle Laughlin are also executive producers. The Muppets is produced by ABC Studios and The Muppets Studio. The Muppets premieres Tuesday, September 22nd on ABC. 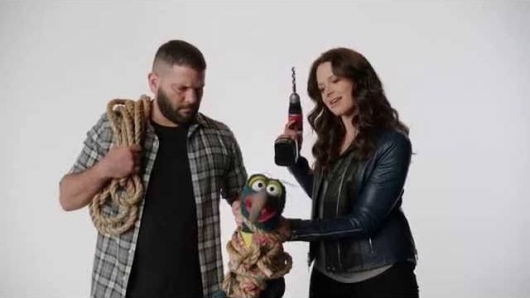 Guillermo Diaz and Katie Lowes from Scandal threaten Gonzo. Scandal’s Guillermo Diaz thinks Animal has a problem with him. But that’s just how he sleeps. The Muppets premieres Tuesday September 22nd on ABC; Scandal returns September 24th. The Goldberg’s Wendi McLendon-Covey loves a good pun, but Pepe The Spicy King Prawn may have taken things to far.